» Is effective disclosure killing influencer marketing? Is effective disclosure killing influencer marketing? Falling engagement rates hint that disclosure is killing influencer marketing but figures mask best practice results pointing, instead, to poor influencer advertising. Last month the Competition and Markets Authority (CMA) - the UK watchdog responsible for consumer protection - announced an investigation into influencer marketing practices. As part of the investigation it wrote to a range of social media influencers to gather more information about their posts and the nature of the business agreements they have in place with brands. The CMA investigation is considering the extent to which influencers are clearly and accurately identifying any commercial relationships, and whether people are being misled. If the CMA finds practices that break consumer protection law, it can take enforcement action. 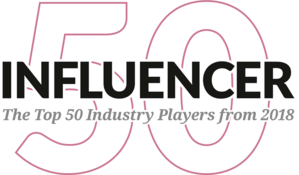 Is effective disclosure killing influencer marketing? On the face of it the figures appear to confirm it does. But the figures point towards the perils of influencer advertising and mask the benefits of pure influencer marketing. CampaignDeus, an independent influencer marketing benchmarking and measurement outfit*, has produced some interesting research on Instagram posts. It found there is a significant negative variance when using an admarker such as #ad or #spon on paid-for content versus organic content. The variance widens depending on the admarker used. The most popular admarker is #ad with over 60% of marked paid-for posts containing this hashtag. 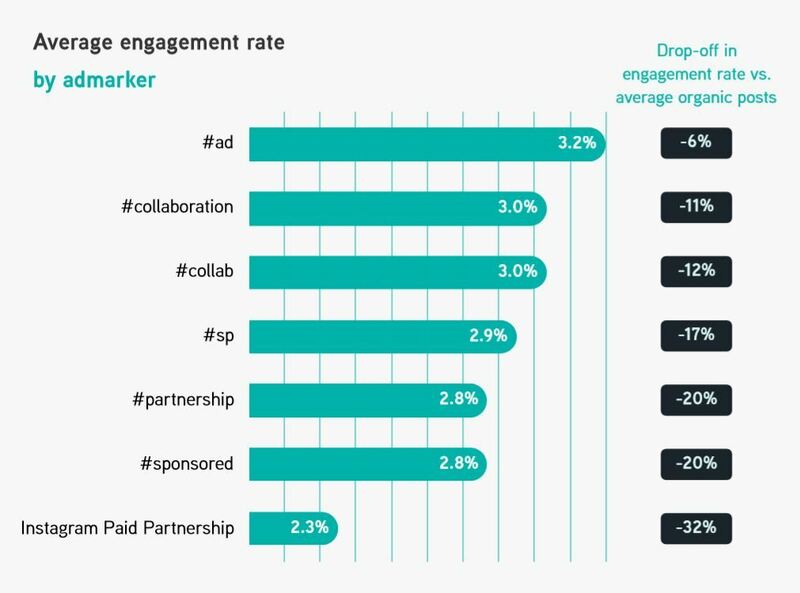 The #ad admark also has the lowest negative impact on engagement rate. Instagram's Paid Partnership fares the worse. This tag reduces engagement rates by over 30%. Further, average engagement rates on brand sponsored posts decline as account sizes grow. The drop-off between brand sponsored and natural influencer posts increases as account sizes grow. Influencer marketers should not be defeatist. The drop in engagement rates for Instagram paid-for content should not be automatic. 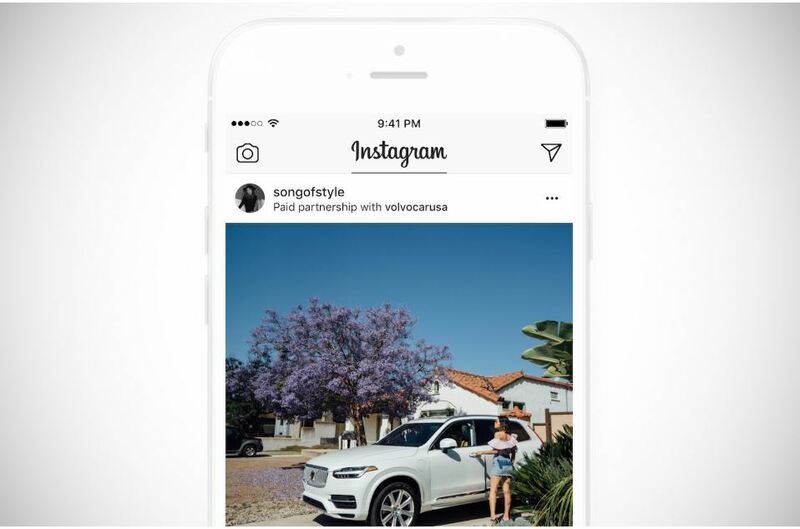 They point more to the abundance of influencer advertising on Instagram rather than tried, tested, effective influencer marketing. The drop in engagement rates, is because the content delivered on much Instagram sponsored content is sub par and flooding our newsfeeds. But it doesn’t need to be this way … . When we buy a magazine we do it because we like the type of content it provides. We like the topics the magazine covers be it fashion or business, food and drink or industry news. We also buy the magazine because we like the way the content is delivered. The style of writing, the world-view of the masthead. We share their values. We identify with both the journalists and the masthead. We don't buy the magazine for the advertisements the magazine publishes. But, we recognise there's a commercial imperative for the masthead to carry ads. They tend to subsidise the magazine's cover price. We draw the line though if we feel the ratio between paid-for and editorial content is out of kilter. We vote with our feet. We stop buying the magazine. It's the same argument with influencer marketing. 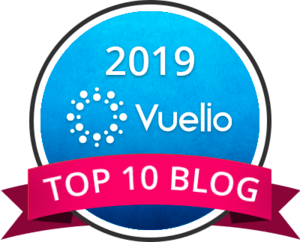 Will follow influencers because of the subject matter they cover, because of their expertise, because of their world values, because of their tone of voice. We relate to them. They're one of us. We don't pay a subscription to see their content (not yet anyway). Our payment to them is our attention. We understand that for many successful social media influencers the creation and distribution of content is their main source of income. There's a commercial imperative for these influencers to work with brands on sponsored projects. And, we're okay with that. The paid work is needed to subsidise their organic content. We don’t feel hoodwinked into thinking the content is organic. If it's an ad it ‘must be obviously identifiable as such’. This means we should be able to recognise something is an ad without having to click or otherwise interact with it. Since it needs to be ‘obvious’, consumers shouldn’t have to work too hard to figure it out. We don't like to feel tricked. The content is relevant to us and of good quality; it educates, entertains, informs or inspires us. By relevant I mean the partnership between brand and influencer feels natural because it feels credible. There is an obvious affinity between brand, influencer and audience. We're not inundated with paid-for content - our favourite influencers produce a ratio of organic to paid-for content which we deem to be acceptable. This is probably no more than 1:3 sponsored to organic and ideally 1:4 or fewer. 61% of women said they won’t engage with an influencer’s sponsored content if it doesn’t feel genuine, according to a global survey of 20,000 conducted by Bloglovin, a blog aggregator site. At their core, true influencers provide consistently compelling content and high levels of community engagement. Over time this helps them earn trust from their fans and establish themselves as credible voices. Trust and authenticity are the bedrock of influencer marketing. Lose trust and authenticity and you lose the power to influence an audience, and with it the promotional work. The drop in engagement rates, is because the content delivered on much Instagram sponsored content is sub par and fails at least one of the three of the above criteria. There is a drop in engagement rates due to the conflation of influencer advertising and influencer marketing (transactional vs relationship-built). So, no, effective influencer marketing shouldn't be damaged through the utilisation of admarks. But pressure for marketers to demonstrate ROI combined with a pressure for influencers to retain attention and action from their audience means that influencer marketing has to up its game. Focus on producing harmony in influencer marketing ecosystem between brand, influencer and audience. * I am a former strategic advisor to CampaignDeus. Get guides, opinion and tutorials about how to benefit from modern PR, marketing and business delivered FREE to your email inbox.